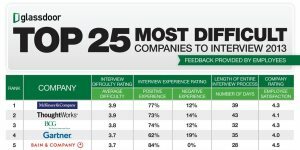 Social jobs and careers community site Glassdoor recently released its third annual report of the “Top 25 Most Difficult Companies to Interview,” a compilation of companies that stand out for putting job candidates through the most difficult interview process. The list is entirely based on tens of thousands of interview reviews from candidates over the past 12 months. The top three most difficult companies to interview for are McKinsey & Company, Thoughtworks and Boston Consulting Group. McKinsey has topped this list for the past three years. 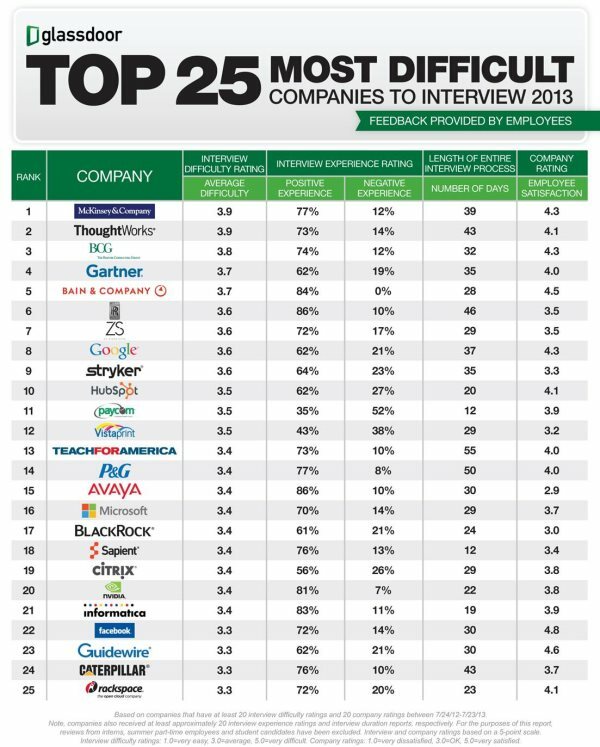 Of the 25 companies featured, Facebook (#22), Guidewire (#23) and Bain & Company (#5) have the highest employee satisfaction ratings. Teach for America (#13), Procter & Gamble (#14) and Rolls-Royce (#6) have the longest interview process, 55, 50 and 46 days, respectively. The average interview process typically took 16 days. More than half (52%) of Paycom (#11) job candidates reported having a negative interview experience, the highest amongst companies on the report. The average negative interview experience was 13 percent. A whopping 86 percent of Rolls-Royce (#6) and Avaya (#15) job candidates reported positive interview experiences, tied for the highest percent of companies. The average positive interview experience was 52 percent.